No half measures on this show. 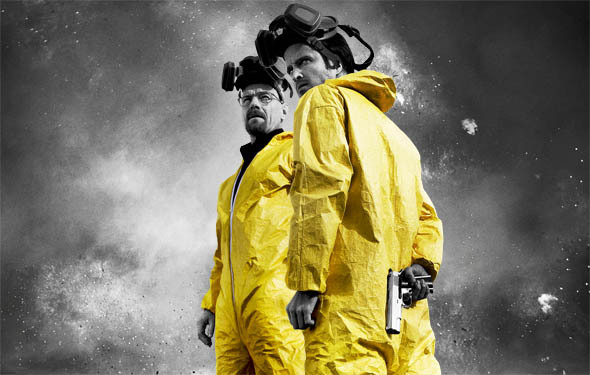 This post is talking about Season Three of AMC’s excellent Breaking Bad. Therefore, there will be spoilers for the first three seasons. This is my first time watching, so if you comment, please no Season Four or Five spoilage. My lovely wife and I continue our Breaking Bad watch. By the time we get into the first half of Season Five, I am hoping that the second half of the season will also be available on Netflix. Otherwise I’ll be feeling as jittery as Wendy with ricin-burgers and no bump. 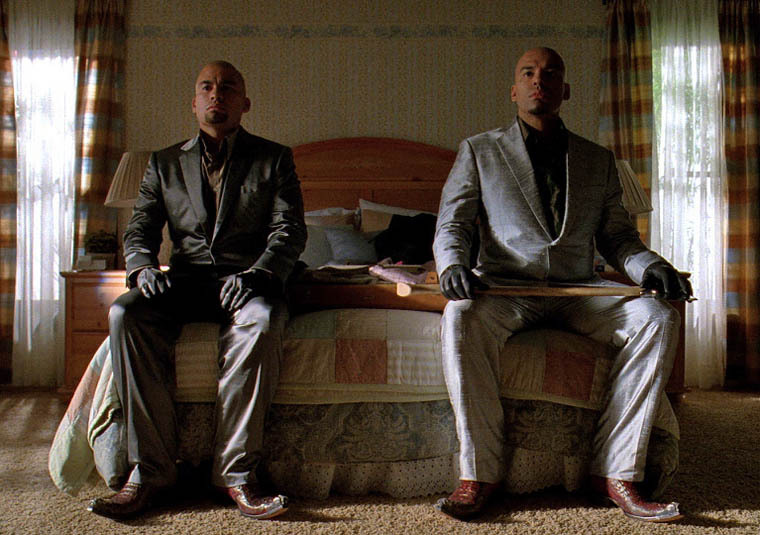 Like my previous Breaking Bad posts, I’ll present a brief recap with some pertinent observations, but save my character analysis, theme discussion, and other commentary for the Part Two post. The season starts off a short amount of time after the Season Two finale which featured the airline collision caused by Jane Margolis’ distraught father. Jesse has been drying out in rehab and coming to grips with Jane’s death. Hank has become eligible again for the El Paso task force, and Gustavo has been busy building a lab under his laundromat. Walt is no longer in danger from his cancer, but he’s still living on borrowed time. Tuco’s cousins from Mexico have crossed the border (accompanied by shootings and a truck explosion) and with the help of a nursing home Ouija board communicate with the very dangerous and vengeful Don Salamanca, Tuco’s tio. Walt and Jesse are homeless in two different ways. Jesse had been evicted from his aunt’s house previously and is clearly unable to return to his old apartment where Jane died. Walt has been asked to leave by Skyler, and has complied. But both plan to return home. 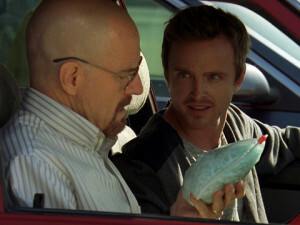 Jesse pays Saul to represent him as an anonymous bag of money with an offer to buy his aunt’s house from his parents; Saul uses his knowledge of the basement meth lab to extort a low price for Jesse. Walt simply decides to move back in to his house, planning on calling Skyler’s bluff to call the police. Jesse despondently finds consolation in listening to Jane’s voice on his cell phone, until her phone service abruptly is terminated. 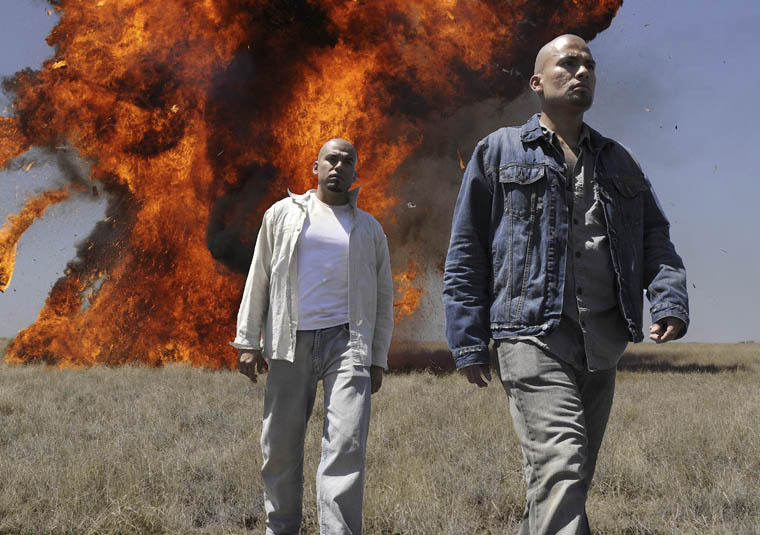 Walt nearly is terminated by Tuco’s cartel connected cousins. A cell phone call from Gus postpones that. Gus has spent the inter-seasonal time to build a super-meth-lab for Walt, and doesn’t want him killed immediately. But there’s a timeline leading to Walt’s death, he has to die to satisfy Don Salamanca and the cousins. Skyler calls the police on Walt, hoping to intimidate him out, but the police can only do so much with Skyler not giving them evidence of wrongdoing or reports of violence. Skyler is crippled by her unwillingness to have Walt Jr’s father arrested. Skyler reacts to Walt’s forcing himself back into the house by sleeping with her boss Ted, and letting Walt know this in no uncertain terms. Walt, already a mess from the constant reminders of the airline disaster, misbehaves during a meeting with the high school principal and gets fired. 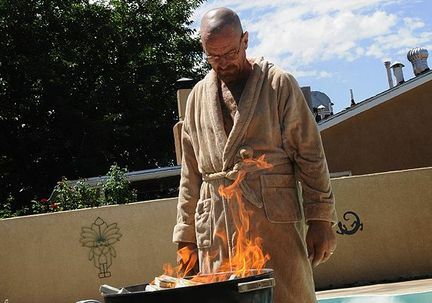 Jesse, adrift after losing his last connection to Jane, cooks meth solo. He goes to Walt to split any proceeds as a courtesy, but Walt freaks out that Jesse would attempt to operate on his own. This leads to the first major conflict between them. Gus tempts Walt into cooking with a new assistant, libertarian chemist Gale Boetticher. Things seem to be working excellently. Jesse is out of his hair, his lab partner aims to please, the money is good. Hank messes this all up. Hank is being pressured to return to El Paso. He uses his Heisenberg investigation as a crutch to avoid that, and gets a break when Jesse’s RV is caught on camera at a gas station where he traded meth for gas. Hank’s investigation nearly catches Jesse and Walt in the RV but a junkyard Constitutionalist delays Hank long enough for Walt to call Saul, who tricks Hank into leaving the scene with a Marie-centric hoax. Jesse Does Not Have the Right to Remain So Damn Handsome, Apparently. Hank reacts badly and soundly beats Jesse up, getting him in hot water with his superiors. Jesse in a rage explains to Walt the hell he will put Hank through. Walt makes a deal. Jesse replaces Gale as Walt’s lab assistant as a peace offering from Walt. Gus is not necessarily on board. Tuco’s cousins can’t wait any longer. They need to kill someone. Gus authorizes that they kill Hank. They fail to do so, since Gus warns Hank one minute before the attack. The DEA reaction triggers the Mexican federal forces to crack down on the Juarez cartel, removing Gus’ competition in meth production. There are delays in production while Walt waits with the family at Hank’s bedside. Walt sees the surviving assassin, who makes an inhuman effort to get to Walt. Walt knows they were after him, and not just Hank. Walt makes a deal with Gus to work indefinitely, to keep himself and his family safe. Skyler decides to use Walt’s money to cover Hank’s medical bills. She invents a cover story that Walt is a gambler which also explains his past behavior, the second cell phone, and their separation. The need for solid money laundering becomes evident, especially to Skyler. Afterwards, Saul Probably Had No Recollection What Skyler’s Face Looked Like. Walt introduces Skyler to Saul. She is not impressed. Jesse decides to skim meth from their production and to sell to the recovering addicts in his rehab group. He enlists Badger and Skinny Pete, but their hearts aren’t into selling to the group members. Instead, they become enamored of the rehab process. Walt can’t sleep at night and is bothered by a fly in the meth lab. He and Jesse try to capture it, since Walt refuses to produce meth while the fly is on the loose. Jesse plans on sedating Walt with sleeping pills, which comes very close to having Walt confess to his complicity in Jane’s death. Good Evening, I’ll be Your Buzzing Guilt and Conscience. At the recovery group, Jesse pursues a young woman named Andrea as a potential customer, but relents when he discovers that she has a young son. He also learns that her brother, Tomas, killed Combo. This fires a rage in Jesse. 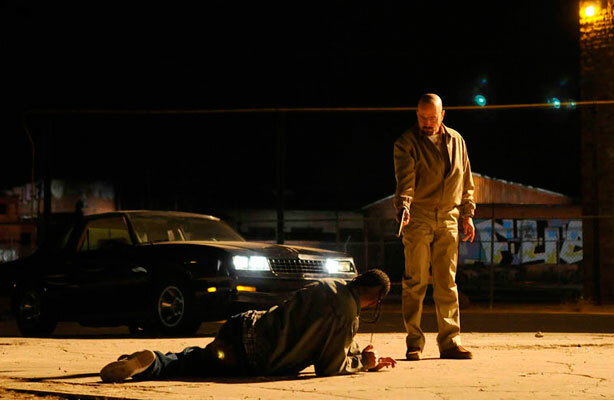 Jesse tries to get Walt to help him kill Tomas’ handlers with ricin. Walt refuses and tries to arrange for Jesse to get arrested on some minor charge to let his temper cool off. Saul brings in his PI, Mike, who refuses to help. Mike tells Walt a story to underscore that half-measures never work. His implication is that Walt should get rid of Jesse. Say What You Will About Wendy, She’s Proven Her Reliability (and Lie-ability) to Jesse in the Past. Mike actually works directly for Gus, not Saul. 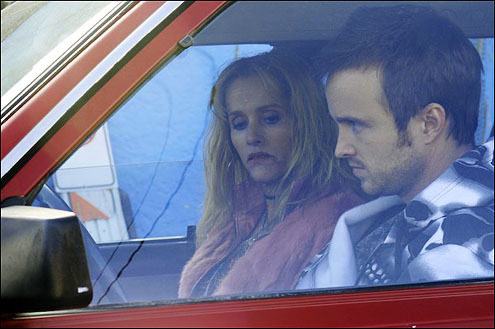 He intercepts Jesse before Wendy the meth-head prostitute can murder the drug dealers with ricin laced food. At a meeting with all involved, Gus forces Jesse to make peace with his drug dealers, with the assurance that they will no longer use children as part of the operation. Tomas is murdered. Jesse goes to avenge Tomas (and to avenge Combo), Walt saves Jesse by killing both drug dealers by running them over and using a fallen gun to deliver a coup-de-grace. Walt Joins the Big Leagues, Relying on Prosaic Bullets Instead of Mustard Gas or Bike Locks. Walt tries to smooth things over with Gus, but Gus is planning on having the newly re-instated Gale learn Walt’s process so Walt can be eliminated. Walt and Jesse make a plan, Walt will kill Gale to keep himself invaluable to Gus. But Gus has already passed the sentence on Walt. At the last minute, Walt gets to make a call to Jesse to go kill Gale, since he’s been detained by Mike. Jesse rushes to Gale’s and puts a gun to Gale’s face. This was a ridiculously exciting season, with everyone having ups and downs. I tried not to put too much detail into the recap (sorry, it was long anyway) but the next post will be dedicated to observations, and maybe predictions for next season. Please don’t confirm or refute my predictions, I’ll mock me publicly no doubt after I watch Season Four. Images are obviously from AMC’s Breaking Bad. i did not like three as much as one or two. I’m not sure. I maybe just lost interest or the show got so far out of hand with the Mexican KFC lord.